New type of field has been introduced. It lets make references from one case to other case. 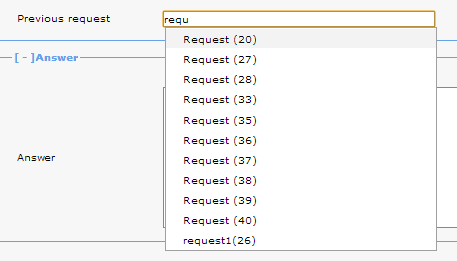 When creating such a field on a form you need to choose procedure of referenced cases. Reference from an invoice to an agreement. Create procedure "Customer", so every case represents one customer. And then reference from other procedures to customers. (In this scenario "Customer" procedure is kind of dictionary, but with possibility to define own fields). Therefore it is important to give proper names to cases. The best way to do it is to create automatic rule changing case names on basis of field values. For example rule can put cusotmer's name, city and VAT ID into case name.